Illinois' Ra'Von Bonner is tackled by Aaron Williams and Khalil Davis during the first quarter. Call it the Efficiency Special. Nebraska 28, Illinois 6. Considering what they’ve been through the past couple of years, Nebraska fans could learn to get used to this. Winning a game by three touchdowns on the road? Did that ever feel strange, relaxing in the second half of a Husker game. Considering the several predictions which had Illinois winning a shootout, life in an efficiency apartment is more than tolerable, considering that Mike Riley has very little capital to throw around at this point. A bit of order can be a comforting thing. Even the length of the game was pleasant. 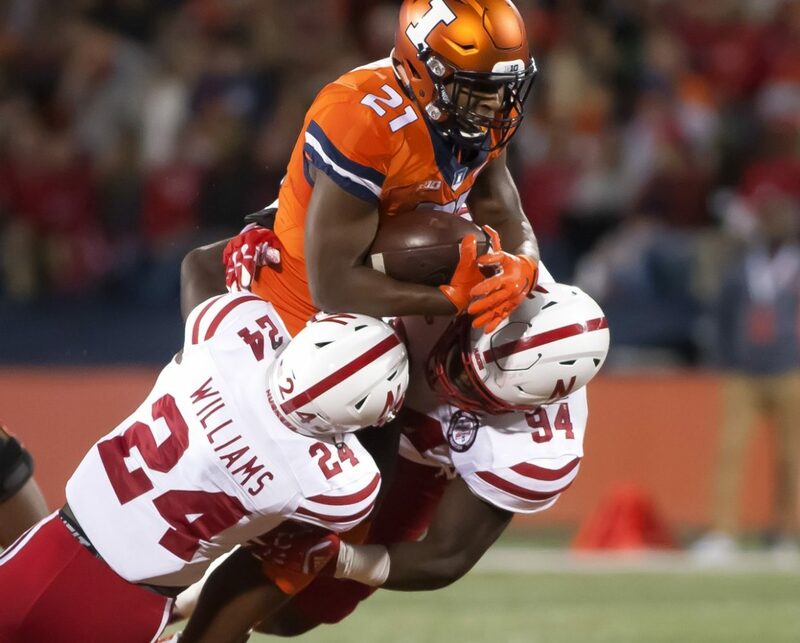 With only a dozen combined incompletions, the Cornhuskers and Illini wrapped up their contest in 3 hours, 5 minutes, shockingly snappy for a televised game. A balanced offensive attack that accumulated 21 points at halftime has at least a decent amount of curb appeal. But what caught my eye is the “6” that the Blackshirts hung on the scoreboard. The beginnings of a real foundation? Nebraska’s defense was not overwhelming, not by a long shot. But it featured 11 tackles for loss, including five sacks, and some inspired play in the red zone, it at least made me think Husker offensive players were telling the truth when they said they found their defensive counterparts “irritating” in scrimmages during fall camp. it appears the front seven is starting to learn their roles in Bob Diaco’s 3-4 defense. I even saw some block destruction going on out there. But the most hopeful thing I saw Friday night in Champaign was the Davis twins starting to take their game to the next level. Both Khalil and Carlos Davis had three tackles and a sack, and they combined for three TFLs. The sophomore defensive ends are becoming quite difficult to block, which should make Nebraska’s linebackers increasingly effective as this season goes on. Ben Stille would agree with that. The Ashland-Greenwood redshirt freshman linebacker had three tackles for loss. Riley improved to 11-8 against conference foes, including 5-5 in road games. The 22-point margin of victory was his second best against a Big Ten opponent, coming in just behind the pick-six-aided 48-25 win in Minneapolis two years ago and just ahead of last year’s 28-7 win over Maryland. Friday night in Champaign felt quite a bit like that comfortable performance against the Terrapins. I don’t expect any more comfort from this team in 2017, although it has climbed above .500 and could produce a few exhilirating moments. The Huskers will have to scratch and claw for points, starting now. Nebraska took control in the second quarter and coasted to the win, largely on the strength of its defense, which held Illinois to 199 yards of total offense, including just 46 in the second half. Giving up just 3.8 yards per play will keep you right in the middle of a lot of games. Not since 2003 has a Nebraska defense held three consecutive opponents to fewer than 250 total yards. The Blackshirts have been a breath of fresh air since halftime at Oregon. But not everything went smoothly for the Blackshirts. Early on, they had a lot of trouble with Illinois’ zone-read run game, especially 6-4, 230-pound quarterback Chayce Crouch. Still, they’re putting the Huskers in position to win. Tanner Lee had a nice night throwing the football, showing that if he gets a clean pocket, he can be an adequate game manager. At one point, he completed 10 consecutive passes. Lee had a good second quarter, because he had very little pressure. Mike Riley and Danny Langsdorf like efficiency, and Lee gave them efficiency against Illinois. Think Alex Smith of the Kansas City Chiefs playing against the Browns, only without Smith’s running ability. Lee was 17-for-24 passing for 246 yards and three touchdowns with no interceptions and a 10.2-yards-per-attempt average. I’d take that all year long from Lee if I could get it, but if he has to deal with any more pressure than the young Illini defense dialed up — two sacks and three quarterback hurries — he won’t approach that kind of eficiency against the rest of the Big Ten schedule. He’s not effective when he hears footsteps, at least not at this point in his career. Stanley Morgan returned to the lineup after sitting a week with a neck ailment. He wasn’t at full speed, but he made a huge difference, catching eight passes for 96 yards and a touchdown. On that play, his stiffarm and sideline tighrope running had “playmaker” written all over them, but Morgan also had but had three drops and a fumble. Devine Ozigbo showed what he can do as a fourth-quarter hammer. He finished with 18 carries for 103 yards and showed a nice combination of speed, toughness and balance on his 15-yard touchdown, but also fumbled. Those types of miscues will hurt tremendously against Wisconsin and Ohio State. Any lightning bolts De’Mornay Pierson-El can hurl in the punt return game over the next two weeks will be magnified tenfold, because it’s going to be hard for the offense to stay far enough ahead on down and distance to get north of 250 total yards against either the Badgers or Buckeyes. DPE’s 45-yard touchdown reception on his team’s first drive finally showed the yards-after-catch value that Riley’s pro-style offense is supposed to be able to deliver, but I fear they’ll show less explosiveness the rest of the way against better defenses. Barring a dramatic improvement in offensive line play, this Husker offense probably hit its ceiling against Illinois, but the defense will continue to improve. The Huskers will go as far as Diaco and the Blackshirts can take them from here on out. If the offense can avoid turnovers, NU can stay close in every game on its schedule, probably picking up a few 17-14 and 20-17 wins here and there and earning a bowl bid. I’m not sure I can see far beyond that.